Whether you are a leader of an established healthcare organization or making investment decisions, Chase sheds lights on non-­obvious threats and opportunities. Chase combines his knowledge working insides dozens of healthcare organizations with his time spent away from healthcare in digital media. Parallels with traditional media companies are strong and disturbing for healthcare incumbents. Seemingly intractable regional monopolies and oligopolies found it easy to discount emerging organizations that were growing exponentially, yet hardly noticed. Chase draws on the Health Rosetta Principles for a New Health Ecosystem that is a set of guiding principles for success in the transformed health ecosystem. The Principles were curated from the leading minds in healthcare. Many of the principles for success are a polar opposite from the status quo. Chase provides examples of how winning organizations using these principles to gain a competitive advantage. A few years ago, Dave wrote a piece that was very influential in helping us rethink how we approached the market. Early on in our process, his discussions with our team put us on a trajectory that is coming to fruition today. The byproduct is a transformed go­to­market approach including the fundamental products and services that we are offering. When we had a global executive meeting to kick off the company shift, Dave was a natural fit as the kick­off speaker. Despite short notice, Dave was able to juggle his schedule and join us in Brussels. We invited Dave to speak at the Bakken Fellows Colloquium where the executive committee of Medtronic gather with the individuals who have earned the prestigious designation as a Medtronic Bakken Fellow. The executives and fellows gather to explore the state of medical technology and help set the direction for Medtronic’s future. Dave was selected as our keynote speaker for his vision of healthcare for the patient and where the industry is headed particularly with respect to personal health monitoring. His presentation was visionary and inspiring. The presentation triggered conversation and action which continues today. Like others in the healthcare space, we are infusing an innovation mind­set into our business. I worked with Dave while developing a Innovation Summit that brought together some of the leading minds in Digital Health. Dave is one of the leading voices in the movement towards recognizing the strategic value of patient engagement, and was a natural person to invite to our global Innovation event. Dave was easy to work with and people were provoked by the ideas and thinking he shared. Dave’s ideas were very helpful as we bring in a new kind of thinking to ensure we continue to improve the value proposition to our customers. Bottom Line: Dave is a thinker, leader and creator and I highly recommend working with him. Dave has been a sounding board for our new strategic direction so he was a natural speaker to invite to Medtronic's Innovation Week. Dave possesses a deep background in new ventures and patient-centered models that is balanced with understanding how to drive change inside of a well-established market leader. He has a good way of nudging people out of their comfort zone so they are receptive to some of his out-of-the-box ideas. Since those ideas are drawn from real world success, rather than some vague vision, it's the kind of practical guidance that people can take back to their work. We asked Dave to speak at our Global Development Senior Leadership Meeting. As Bayer seeks to capitalize on the tremendous opportunities ahead, it was great to have him share his insights from how patient-centric offerings can create competitive advantage. He gave us a set of guiding principles for how to think about the opportunities and challenges ahead. Like many well­ established Life Sciences companies, we wanted to challenge our thinking in terms of how to evolve with the changing healthcare market. When we thought of who would be the most appropriate guest speaker to bring into the US Pharma leadership meeting, Dave was a natural choice. While he’s a “startup guy”, he’s been a leader inside multibillion dollar enterprises. His balance of pushing our execs out of their comfort zone with the pragmatic realities of the challenges of large scale change was on the mark. Each year, we gather digital health innovators from around Canada and the globe to share world-changing ideas, showcase breakthroughs and network. I believe Dave’s work around the 95 Theses for a New Health Ecosystem and the open source Health Rosetta project is ground-breaking for startups, healthcare organizations and public health organizations whether they are in Canada, the U.S. or in Europe or Asia. Dave’s insightful talk motivated our audience to think bigger and more disruptive than when they walked in the room. His performance at INTERFACE Health Summit was valued by our international audience and recognized with the “Best Speaker” 2015 INTERFACE Health Summit Award. I highly recommend Dave to speak at any world-class technology event. 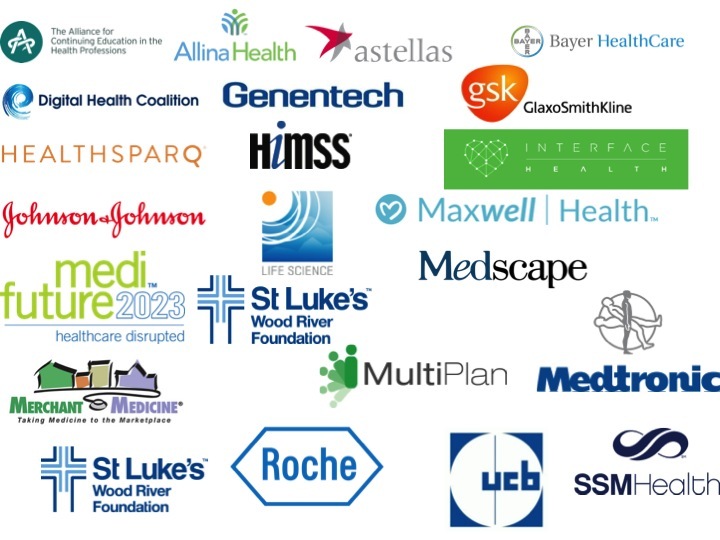 Each year, my company gathers its most important client partners to share our viewpoints on the future of healthcare. We selected Dave as a featured speaker because of his thought leadership in health IT and passion for reinventing healthcare. It was clear he spent time thinking about what would be most inspiring and provocative for a health plan audience. He developed some new concepts that we hadn’t heard before. Dave is great at drawing lessons from other industries and applying them to a new context. I make it a point to seek out Dave's position when looking for insight and creative ideas. Susan Mohler VP, Marketing MultiPlan, Inc.
We brought in Dave to speak in front of our most important partners. He was our go­-to guy whenever we wanted to address how to transform an organization to be truly patient­ centric. We appreciated how he shared inspiring stories of what was going on beyond most people’s radar, yet was destined to be transformational for the entire industry. As a fellow startup founder who gets how important it is to transform the way health and wellness services are purchased, Dave was a natural to have speak at our company­-wide meeting. It was a great boost to our team to have someone from outside the organization validate the direction. I can’t think of many people who are more passionate about how critical it is to our future to overhaul the status quo. We invited Dave into our annual strategy retreat to bring his perspective on what it will take for Life Sciences companies to succeed in the future. Dave has a nice way of pushing people out of their comfort zone to inspire them to take a new approach to how an organization can succeed in the population health era of healthcare. I’d highly recommend him for others who may have a similar need. We liked how he described how being patient ­centric was much more than a nice catchphrase but a new way of operating. As we seek to foster an entrepreneurial community, we like to bring in big thinkers from various industries. With healthcare representing nearly 20% of the economy and massive changes afoot, it was super useful to get Dave’s broad industry view balanced by his own startup experiences. Dave keynoted our annual Digital Health Coalition Disrupt event. For many of our members, they are seeking ways to break down silos. Dave has been described as a silo­buster so our membership enjoyed him sharing how market­-leading organizations are breaking down silos and adding the greatest value to their constituents — patients and doctors. Dave’s background working in both large multibillion dollar enterprises and startups is a great perspective to bring to our members. When I read the 95 Theses, I got the same goosebumps that I did when I read the Cluetrain Manifesto in 2001. Cluetrain was an amazing collection of ideas and thoughts on what the future of business was going to look like given the business and Internet memes of the time. Cluetrain is as relevant today as it was 14 years ago when it was first published. To me, 95 Theses is to healthcare what Cluetrain is to tech businesses.